Types of Pink Wine | What's Difference Between Rose and Blush Wine? "Paul, I've seen the same grapes listed in a wine labeled 'Blush,' 'Blanc' or 'Rosé.' What's the difference?" Very interesting question, and one, I'm afraid, that may not be as easy to answer as it seems. First of all, none these terms have a legal definition associated with them, which makes telling the difference between Rosé and blush wines, or even blanc wines, rather difficult. Pinot Noir Blanc is a white, or even slightly pink, wine made from a red grape. Chenin Blanc and Pinot Blanc are white grapes with the word "Blanc" in their titles. So, it's easy to see the confusion between different types of pink wines. When the term "Blanc" is applied to a red grape, it usually means that the wine was crushed with very minimal skin contact. It is the skin contact that gives the juice its color. The juice of nearly all red grapes is pure white. Without contact with the grape's skin, the wine would be white. Usually, a red grape need only make contact between the juice and the skin for a few hours to get that "blush" of color in the wine, ergo the term. A red grape used in the making of a white wine is common in Champagne where the majority of the grapes used are red, Pinot Noir and Pinot Meunier. They are crushed with no skin contact, which is why most Champagnes, though made with red grapes, are white. A Rosé is normally a type of pink wine made from a red grape that has had a little skin contact to give it the pinkish color. But again, there are no rules. Just look in the store and you'll see wines labeled Rosé that span the spectrum from the slightest pink to a fairly dark magenta. You could also make a Rosé wine by taking a white wine and adding red wine to it until the desired color is reached. This is an experiment you can try in your own kitchen. Of course, all of this assumes that there is some end result in mind. Most of the blush wines are of little consequence in terms of quality or ageability. They are normally made from inferior wines that have been slightly sweetened, so as to hide their flaws, and blended so that there is an acceptable flavor at a competitive price. The truly wonderful Rosés from France's Tavel and Anjou regions are highly regarded and priced accordingly. Unfortunately, this entire category has been dismissed by Americans because we were inundated by mediocre wines labeled "Rosé." As a result, very little of this wine is made that can be compared to the French counterparts. There are a few, however, and they are worth seeking out. A great Rosé is a sublime match for hearty foods like bouillabaisse, cioppino and the like. 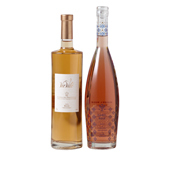 Want to taste some great Rosés? See below for some outstanding bottles currently available on our site. There is a genuine treasure trove that I taste each week, and I'm thrilled to share these finds with you. If you'd like to learn even more about Rosés, I am now privileged to select two Rosés every other month for our diverse new Rosé Series club. Wines in this club come from wineries from all over the world and represent some truly special vintages. Each shipment is accompanied by our full-color newsletter, packed with information for both the novice and experienced wine lover. It includes winery and winemaker history, recipes, cellaring and serving suggestions, and wine anecdotes to share. The Wine of the Month Club's Rosé Series Membership delivers two curated bottles of Rosé to your door every other month. You can treat yourself, or treat a friend to a Rosé Wine Series Gift Membership. Click here to learn more about the Rosé Series Membership. Click here to learn more about the Rosé Wine Series Gift Membership.